Heartworm is a diagnosis that sends chills down the spine of many pet owners as it is perceived as a death sentence. With summer right around the corner, pet owners are beginning to question what they should do for heartworm and if there is any treatments that are safe. The good news is alternatives to veterinary-suggested heartworm preventatives are available and are much safer for the body! Heartworm is a diagnosis that sends chills down the spine of many pet owners as it is perceived as a death sentence. With summer right around the corner, pet owners are beginning to question what they should do for heartworm and if there are any treatments that are safe. The good news is alternatives to veterinary-suggested heartworm preventatives are available and are much safer for the body! What is Heartworm and Heartworm Disease? Heartworm is a parasite, Dirofilaria Immitis, that lives in the animal's heart, lungs, and blood vessels, and is a roundworm that is thin and threadlike. Heartworm disease is when that parasite matures and starts to cause blockages or organ failure in your pet. How Can My Dog or Cat Get Heartworm? 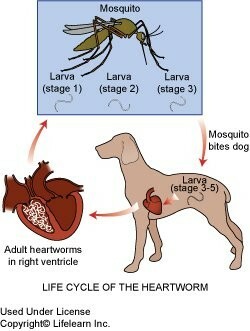 Heartworms are transmitted by an infected mosquito carrying the L3 heartworm larvae to your animal. These larvae must have already gone through two transformations before reaching the L3 stage. In order for a mosquito to become a carrier for heartworm, it must have bitten an animal carrying the L1 larvae or the microfilariae. The microfilariae are the offspring from the L5 or adult heartworm. All this means is that in order for the mosquito to pick up the microfilariae, the bitten dog must have L5 adult heartworms. If the microfilariae are not taken by a mosquito they simply die as the mosquito is needed to get them from the L1 to L3 stage. If your dog has been bitten by a mosquito carrying the L3 larvae, these larvae must travel from the mosquito saliva around the bite into and through the bite hole in the skin. The L3 larvae will then spend the next 14 days developing into the L4 larvae, and the next three to four months developing into the L5 larvae where it will actually enter into the circulatory system and travel toward the heart and lungs. In order for the L1 larvae to develop into the L3 larvae, the temperature must remain above 57 degrees Fahrenheit both day and night for a minimum for 14 days. Heartworms can ONLY be passed from a mosquito to your animal and not from one infected animal to another. Animals and wild dogs have been living in coexistence with heartworms for hundreds of years. Dr. William Falconer, DVM says: "The heartworm has been out there forever as far as we know, but we don't read reports of wolves and coyotes being wiped out by heartworm, and yet domestic dogs are falling prey to it." Wild animals, however, are eating raw, biologically-appropriate foods and are not subject to immune-suppressing medications and over vaccination. Heartworm is more prevalent in southern states because of the weather. In order for the L1 larvae to develop into the L3 larvae, the temperature must remain above 57 degrees Fahrenheit both day and night for a minimum for 14 days. Heartworm, like all parasites, bacteria, and virus become resistant to preventatives. Heartworm preventatives have only been on the market for about 28 years. Those who are funding the American Heartworm Society are those who are making the most money from it (i.e., the creators of the heartworm preventatives). How Can You Prevent Heartworm Safely and Naturally? Build the immune system! Animals with a healthy and strong immune system are less susceptible to infections. Start in the gut! Species-appropriate nutrition is key! Keep the blood clean. Healthy animal blood has a scent and taste that mosquitos (as well as fleas and ticks) don’t want. It is much too bitter. However, animals that have dirty blood smell sweet to them. Keep mosquitoes at bay. Essential oil sprays and products like the Dr. Harvey’s Protection Spray and Earth Animal Flea and Tick Program Spray help to keep mosquitoes away as well. Be proactive about de-worming your pet. Not all parasites are caught in blood and stool tests. You can use a natural de-wormer yearly to help keep your companion safe from heartworm before it becomes heartworm disease. Holistic Blend and Earth Animal have great options that are both cat and dog safe. If you would like more information, please contact us. We offer in-store, as well as online consultations to help pet owners find the right course of action to safely and naturally support their pets.